Visible from Antarctica, The Southern Ocean and parts of Southern Africa, this eclipse pales in comparison to the eclipse on 20th March. Up to 90% of the sun will be covered at maximum eclipse (visible from Antartica only). 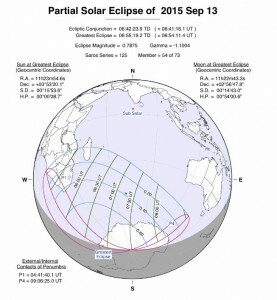 Southern Africa being the only more accessible part of the world that can witness this eclipse, will only get a partial eclipse of 40% or less.